Former Secretary of State Madeleine Albright and Former Secretary of Defense Willian Cohen will be co-chairing a new task force to develop guidelines to prevent future genocides. Referred to as the Genocide Prevention Task Force, the group is being implemented by the U.S. Institute for Peace, the United States Holocaust Museum and the American Academy of Diplomacy. The international community heaped a lot of criticism on the United States for not becoming involved in Rwanda’s 1994 internecine war and for again reacting too late to Sudan in 2004, when then-Secretary of State Colin Powell labeled the situation there a genocide. The Sudanese government has denied that label is accurate. She said the idea for the task force came from the unfortunate history of failure of efforts to prevent genocide around the world. At the time of the Rwandan genocide, Albright was serving as the United States Ambassador to the United Nations. She argued in a PBS interview (years later), that “in retrospect, it all looks very clear. But when you were [there] at the time, it was unclear about what was happening in Rwanda.” Later, as she served as Secretary of State, she was largely responsible for the United States position in the Balkans. All of which opens the question, can officials trained in a climate of ignoring genocide for political reasons come together to create future policy that may impact nations in a positive way? It’s fairly well known that I’m hoping to eventually complete a PhD in Holocaust and Genocide Studies. While talking with a co-worker about this a few months back, I mentioned that it would be interesting to study how the survivors of the Holocaust coped with their ordeal versus the survivors of modern genocides. In a not dissimilar line of thinking, Janine Beck, a PhD student at Queensland University of Technology, conducted a study that revealed that depression, anxiety, and trust issues were all elevated in descendants of Holocaust survivors. The children and grandchildren of survivors experienced depression and anxiety at a higher rate than the general population, Ms Beck said. They also had more difficulty trusting others, which leads to difficulties in relationships. The researcher said the traumatic after-effects of the Holocaust flowed to subsequent generations through the way survivors interacted with their children. “Survivors were either over-protective or clingy because they were fearful that something would happen to their children or they were dismissive and pushed their children away in an attempt to prevent any future hurt,” Ms Beck said. The study showed that the most affected survivors – those who spent time in concentration camps or were the sole survivor in their family – had children who were the most affected. “In addition, survivors from Hungary and Eastern European countries appear to have suffered from higher symptom levels than those from Western European countries,” Ms Beck said. I imagine that Beck’s findings would translate fairly uniformly to places such as Rwanda and Darfur. I do wonder, however, if the availability of mental health services wouldn’t factor into the outcome, leaving impoverished countries with greater suffering and a more prolonged impact. I was particularly grateful to see Beck’s study as the question I had originally asked was one that I would never actually get around to answering myself. I’m interested to see if she goes on to do similar studies with different conflicts. 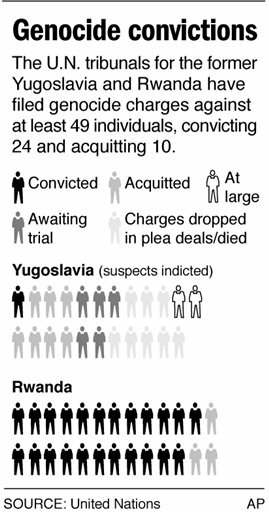 The UN recently put out a nice graphic (pictured to the right) that shows the conviction rate for genocides in Rwanda and the former Yugoslavia. Not surprisingly, it’s fairly difficult to prosecute criminals for genocide as it’s extremely tricky to prove intent. Keep in mind these numbers are for those individuals who have been arrested and prosecuted for genocide and doesn’t include the charges for crimes against humanity or war crimes.